It's Australia Day here. I thought for a while about what I should cook. Initially I was going to cook individual beef pies - a very Aussie snack - but in the end I settled on a single larger Kangaroo pie because it'd let me consolidate my larger pie making a little. 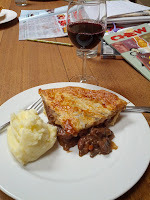 This recipe is adapted from sbs.com.au with my own variation - double pastry or a full case (or "pot pie" as Americans call it - something I just learned.) I've adapted the shortcrust pastry recipe from the Lemon Meringue Pie by removing the sugar and lowering the butter content just a little. 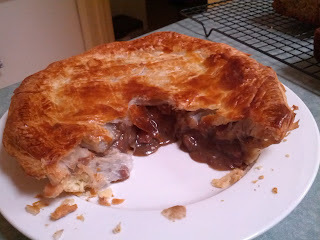 I was going to make it a Kangaroo and Emu pie, but I was overruled. Chop kangaroo fillets and dust in flour. Heat 2 tbsps of olive oil in the pan. Brown the meat in batches and set aside. Finely dice the onions, carrot, and celery. Add more olive oil to the pan. Cook for around 10 minutes until soft and add sliced garlic. Add meat and vegetables to a pot and add the stout. Top up with beef stock and a splash of Worcestershire sauce. Reduce and simmer for an hour and a half until meat softens. Leave the lid off for about half an hour so the gravy reduces. If necessary add a little more flour to thicken it more. Add mushrooms about 15 minutes before cooking time is up. While that's going, make the pastry case. This uses the same method as the pastry from the Lemon Meringue Pie. That should take about an hour. Once the filling's simmering is done, add a teaspoon of tomato paste and thyme leaves. Add more tomato paste if you like it a bit sweeter. Then transfer mixture to the pie dish. Increase oven to 200°C. Cover with the puff pastry, trim, cut some vent holes in the pastry and brush egg wash over the top. Bake the pie in the oven for 20 minutes until the crust is golden brown. With an appropriate cooking pot you could do all of steps 1-3 in the same pot. I had to work with two. Also, while making this I realised I didn't have any tomato paste, so ended up cooking it with none and the recipe was fine. I think it would've been nicer with the tomato paste though, so I've left it in the ingredients. It was pretty delicious and the roo was nice and soft after the long cook.